Antimicrobial resistance (AMR) is now a major global public health threat. Despite the recognized need for new antimicrobials for clinical use, the reality that only two new classes of antibiotics have been brought to market in the last 30 years and many drug developers have left the field. ND4BB is part of the “Action plan against the rising threats from Antimicrobial Resistance” adopted by the European Commission in answer to the Council Conclusions and European Parliament resolution to “establish an EU-wide plan to combat AMR". New Drugs for Bad Bugs aims to join forces between public and private partners in order to bring new antimicrobials closer to patients, to share information and to boost research on improving the uptake (and decreasing the efflux) of antibiotics into Gram-negative bacteria which is one of the greatest challenges facing drug discovery for Gram-negative pathogens. Antimicrobial resistance (AMR) has become a major and global public health threat. According to the World Health Organization (WHO), ‘antibiotic resistance is becoming a public health emergency of yet unknown proportions’. In the EU, AMR is responsible for some 25 000 deaths a year, and the annual treatment and social costs are estimated at some €1.5 billion. Despite the recognized need for new antimicrobials for clinical use, the reality is that only two new classes of antibiotics have been brought to market in the last 30 years. 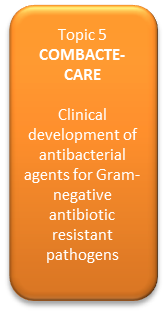 The urgency for novel antibacterial drugs becomes especially true when considering resistant Gram-negative infections where the use of drugs of last resort, such as colistin, has been increasing over the past years. 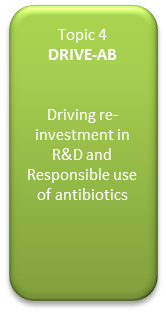 The New Drugs 4 Bad Bugs (ND4BB) initiative is a series of programmes designed to directly address some of the scientific challenges associated with antibacterial drug discovery and development. The over-arching concept of ND4BB is to create an innovative public-private collaborative partnership that will positively impact all aspects of AMR research with benefit on the future discovery and development of novel agents for the treatment, prevention and management of patients with bacterial infections. 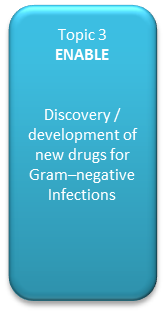 The discovery of new agents to treat resistant Gram-negative infections generally relies on developing agents that can penetrate at least one, often both of the membranes of the Gram-negative cellular envelope. This envelope, comprised of both an outer and inner membrane, which have significantly different properties, provides Gram negative bacteria with an excellent physical barrier to antibacterial agents. Furthermore, if an agent is able to penetrate one or both of these membranes, it is often subject to rapid efflux out of the cell by numerous broadly acting efflux pumps - rendering the agent ineffective. This intrinsic penetration barrier, combined with potential for rapid efflux often leads to where a compound with good intrinsic activity at an intracellular or periplasmic target displays poor whole cell antibacterial activity. So far, this represents an unsolved problem for drug discovery efforts. If these processes were better understood, it would provide the industrial, biotech and academic community new perspective and tools for the discovery of new antibiotics to treat the severe, multi-resistant Gram-negative infections that are becoming more and more common in Europe and across the globe.